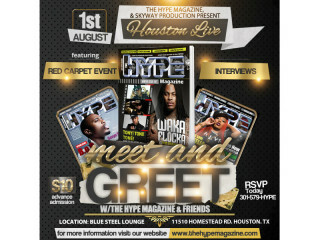 The Hype Magazine will present a Meet and Greet Red Carpet Experience, including appearances by DJ Michael “5000” Watts, Houston music legend Z-Ro (Original member of DJ Screw’s “Screwed Up Click), Dallas’ own Mr. Marc D (of the GS Boyz), Brandi Clinton (daughter of George Clinton), Chloe Riley (cast member of Oxygen Network’s Sisterhood of Hip Hop, Slip N Slide Records hip hop artist), New Houston sound master Branzil, singer Just Brittany, New Atlanta R&B crooner Travis Daniel, The Hype Magazine’s CEO Jameelah Wilkerson, Fashion Editor Daja Marie and Editor N Chief Jerry Doby. Key highlights from the night will include a “Who’s Who” tribute to the Houston entertainment industry, including recognition of historical Houston music icons “Screwed Up Click.” The tribute recognizes the global impact its leader and innovator DJ Screw (RIP) created with this trendsetting sub-genre of Hip-Hop. Also being recognized will be Dj Michael Watts and OG Ron C who continue the legacy. Screwed Up Click artists scheduled to be in attendance at the event include Z-Ro, Lil Keke and Big Pokie. The evening will also feature the unveiling of The Hype Magazine’s August 26th digital cover with Mr Marc D. The superstar is best known for the hit singles “Stanky Legg” and Booty Dew” as part of the gold selling group GS Boyz. $10 for General Admission; $50 for the Hype Hottie/Hunk Contest; $75 for the Artist Performance.